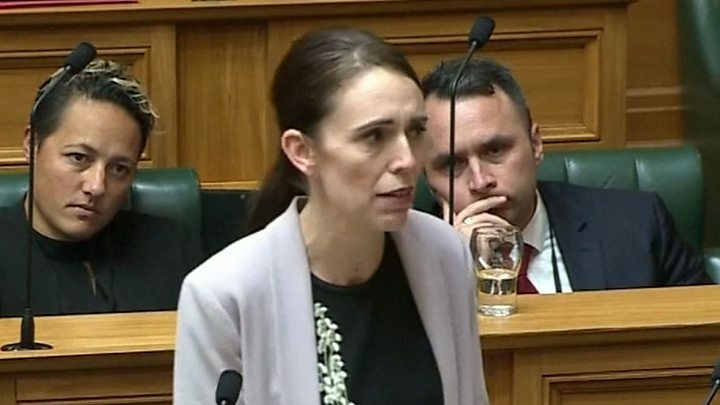 Media captionNew Zealand PM, Jacinda Ardern: "These weapons were designed to kill"
New Zealand's parliament has voted to ban military-style semi-automatic weapons following the Christchurch attacks. Holding back tears, she told parliament on Wednesday that MPs were there "because of the victims and families". She said that when she had visited the injured in hospital none of them had had just one gunshot wound. "They will carry disabilities for a lifetime and that's before you consider the psychological impact," she said. The new rules make changes to 1983 gun laws which have been the subject of several reform attempts. They prohibit military-style semi-automatic weapons and parts that can be used to assemble prohibited firearms. The gunman, armed with semi-automatic rifles including an AR-15, is believed to have modified his weapons with high-capacity magazines so they could hold more bullets. The magazine is the part of the gun which stores ammunition. Those breaking the new laws will face between two and ten years in jail. An amnesty will be in place until the end of September. He said the bill was "not an attempt to improve public safety" but "an exercise in political theatre". Jacinda Ardern said parliament was "almost entirely united". "I cannot imagine circumstances where that is more necessary than it is now," she added.